Thanks to Amazon, it’s never been easier to become an online retailer. Just in the US alone, Amazon offers up nearly 2.5 billion customers every month. They’ve spent over twenty years building market trust, which means your products sell fast. And thanks to helpful services like Fulfillment-by-Amazon (FBA) and Amazon Seller Central, you can almost run your entire business on auto pilot! This guide specifically details Amazon Seller Central, what it is and how you can get started with Amazon. Additionally, I’ll show you cool ways to find products to sell on Amazon, what it means to sell on Amazon as an individual seller (instead of as a business seller), what it costs to sell on Amazon, and whether it’s better to sell on Ebay or Amazon. How can I sell my stuff on Amazon? Where do I find products to sell through Amazon Seller Central? How do I do Amazon private label? How much money can I make with Amazon private label? Can I sell on Amazon as an individual seller? How much does it cost to sell as an individual seller? Is it better to sell on Ebay or Amazon? This is what Amazon Seller Central looks like when you log in. To sell on Amazon, you will need to have an Amazon Seller Central account registered. Fortunately, we have a nifty guide that you can read which will help you go through the process of setting up an Amazon seller account. You can sell nearly anything you want through Amazon Seller Central. After all, Amazon has a catalog with millions of products. Some of those products are brand new products from huge brand names. And others are used products, collectibles, and handcrafted items. Amazon shoppers can buy anything from digital books, to video games, to even kayaks. The easiest way to get started if you want to sell your stuff on Amazon, is to sell items that you have lying around the house you no longer need. In fact, this is how a lot of sellers get started as Amazon sellers. You can sell used books, old collectibles, and even electronics you no longer need. Furthermore, not only can you sell your products through Amazon Seller Central as a seller, but you can also trade in unwanted products and earn credit through Amazon Trade-in. There are many ways to find products to sell on Amazon. Retail arbitrage. You buy products in retail stores at a price that’s lower than the lowest available Amazon price and resell it on Amazon. This method tends to involve a lot of work, but very little investment. Online arbitrage. You buy products on other ecommerce websites that are priced lower than the lowest available price and resell it on Amazon. Similar to retail arbitrage, this method involves a lot of work, but you can do it for relatively cheap. Wholesaling. Similar to retail or online arbitrage, except you buy bulk, discounted products to resell on Amazon. This is a little easier than retail arbitrage and can end up being very lucrative. However, it is very competitive. Private label. This is a method of creating your own brand of manufactured products, building a new listing on Amazon, and earning a steady, passive income. While there’s more learning that comes with this method, ultimately it’s less time consuming, far more profitable, and potentially comes with less competition. Amazon private label might sound difficult, but in fact, it’s pretty easy. Product research. 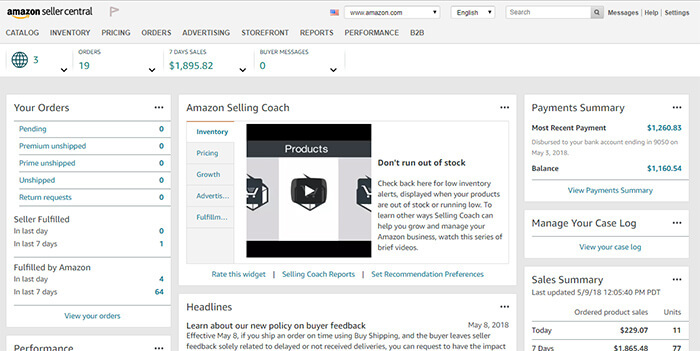 You find profitable product opportunities on Amazon using product research software like the Jungle Scout Chrome Extension or the Jungle Scout Web App. Sourcing. Once you find a good product to sell on Amazon, you’ll want to source the product through a manufacturer resource like Alibaba.com. Create a listing. After you’ve placed an order for your product and it’s being manufactured, you’ll want to build a brand new Amazon product listing through Amazon Seller Central. Launch your product. Once your product hits an Amazon Fulfillment Center, you start giving away promotions and advertising your product. On average, a good, thoroughly-researched private label product opportunity should sell between 250-300 units per month. Each sold unit, after subtracting Amazon fees, advertising costs, and the actual cost of the product, should earn $8-$15 per sold item in profit. That means that the average Amazon private label product should earn $2,000 – $4,500 per month. Imagine what your life could be like with an extra $2,000? Or an extra $4,500? And that’s just one product. As of this writing, I have over 200 SKUs on Amazon, 40 of which are private label products. And that’s my side gig! If you’re interested in learning how to get started with Amazon private label, view our free course with the button below. Yes, you can sell products through Amazon Seller Central as an individual seller. You don’t have to have a business set up. Now, you’ll still have to file taxes like you normally would, but you can do it all through your own social security number or other accepted identification number. There are two basic types of Amazon sellers. First, there are individual sellers. Individual sellers are Amazon sellers who sell products on Amazon more as a hobby than a true side gig or profession. Generally, individual sellers will sell less than 40 products per month. Then, there’s professional sellers. Professional sellers are Amazon sellers who sell products professionally. Usually these are private label sellers or wholesalers who are selling more than 40 products per month. How much does it cost to be an individual seller on Amazon? As an individual seller, there is no upfront cost to sell on Amazon. You simply need to register. However, when you make a sale, in addition to the normal Amazon selling fees, you will also pay a $1.00 flat fee. On the other hand, as a professional seller, you pay $40 per month for the right to be a professional seller. However, there is no $1.00 flat fee. That’s why if you plan on selling 40+ products per month, you should probably consider becoming a professional seller. Related: How much do I need to start selling on Amazon? While both Amazon and Ebay have distinct advantages, in my experience, Amazon is far more lucrative. After all, if you’re a private label seller on Amazon, you have to potential to make over $2,000 with just a single product. Additionally, Amazon has other advantages, such as a much larger shopper base (more than double Ebay’s), high conversion rates, the ability to jump on existing listings and a lot more. Additionally, Amazon has Amazon FBA which makes selling on Amazon far easier. 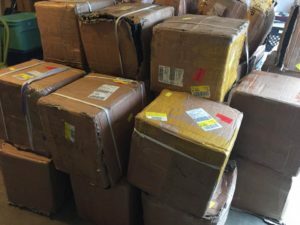 Amazon FBA stands for fulfillment-by-Amazon. 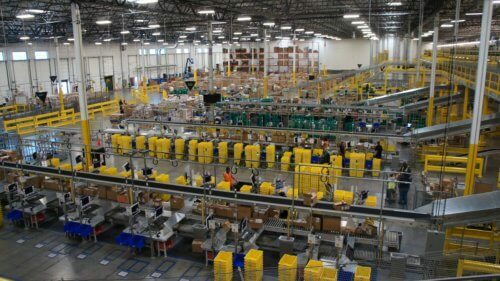 It is a service Amazon offers to help sellers store inventory, pick, pack, and ship inventory in their fulfillment center network. Furthermore, this is all for a very small cost. In fact, the actual cost to store and ship items through Amazon’s FBA network tends to be much less than the cost to ship a product yourself since Amazon has extremely low shipment rates. Additionally, all of the products which you sell through Amazon FBA come with the Prime badge. That means that your products get all the advantages of Prime, including 2-3 day shipping, higher conversion rates, and a better chance of being seen on the product pages. Finally, if you want to learn more about selling your own products through Amazon Seller Central and making a massive passive income, check out these additional resources. So, if you’re ready to take the leap and start doing product research, check out the Jungle Scout Web App and our awesome Niche Hunter tool. Does still work with Amazon? I thought they don’t allow dropshipping model… I’m confused. As far as I know, drop shipping is still permitted on Amazon. Or were you referring to another model? thank you for all this great informative stuff and blog posts! I wanted to ask you how long, or how many orders should I do before I mange to break even ? In your experience is it reasonable to expect to break even with the first order of a product for a new seller ? Im digging into selling on Amazon FBA USA as PL. Recently I have faced with massive confusion about obtaining UPS barcodes. As a new seller i would better to buy it directly from GS1 in order not get into trouble with Amazon. However, i don’t have my own company, and wish for a start to sell as individual. As far as i understood for GS1 barcodes can be bought just by companies. So, this made me confused, is it still possible to sell on Amazon as individual and meet it’s policy about UPS? I could be wrong but I am sure you can get set up on GS1 as a sole proprietor as well as a business entity. The legitimate GS1 GTIN / UPC code policy has been in effect for quite some time now but only recently has Amazon started enforcing it. We’d advise new sellers to go with GS1 at this time. I have a product already packaged inside box, each parts have its plastic bag. Now, I just learned plastic bag need to have warning label for suffocation. I not sure what I need to do? open them again, and labels them? please give your thoughts. Whoops – packaging mistakes happen to the best of us. Could you have your supplier stick a suffocation warning to the outside of each bag?